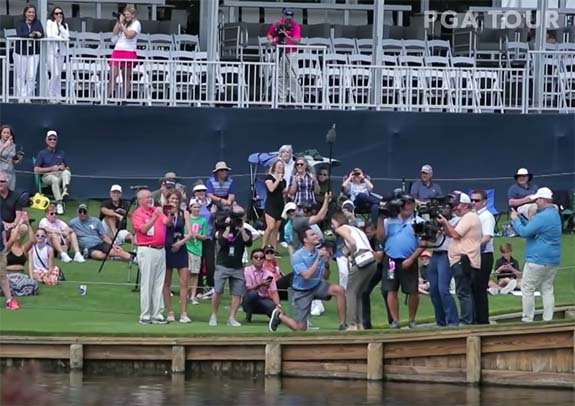 Love was in the air at the 46th Players Championship in Ponte Vedra Beach, Fla., last Wednesday as pro golfer Sergio Garcia was enlisted to help with an epic marriage proposal at the scenic 17th hole. 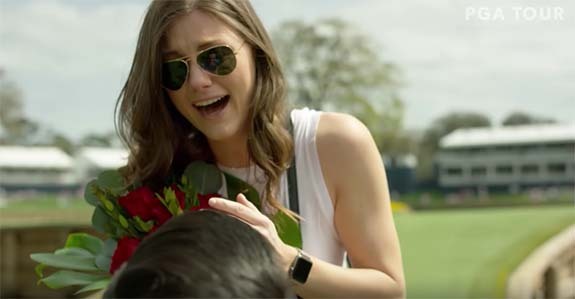 When Ricardo Fonseca started planning a special golf-themed marriage proposal for his girlfriend Emma Baxley, he knew that his future father-in-law, Bob, might be able to pull a few strings. You see, the Baxley family has volunteered at The Players Championship for 44 years. 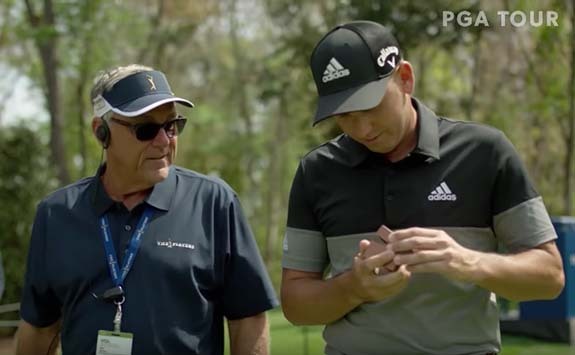 Bob Baxley conspired with Garcia, Fonseca and PGA Tour communications officials to stage a wondrous surprise during the tournament's practice round. It's been 11 years since the Spanish golfer won The Players Championship, and he would eventually place 22nd in the 2019 tournament, but what he did for the young couple was definitely a hole in one. PGA Tour cameras caught up with poppa Baxley and Garcia in the moments leading up to the proposal. "Thanks for doing that," Baxley said, as he handed off the ring box to Garcia. "I really appreciate it." "Can I look at it?" Garcia asked. Garcia opened the box to reveal what appeared to be a cushion-cut diamond in a halo setting. Garcia stashed the ring box in his pocket and the conspirators proceeded to the par-3 17th hole. As they approached the green, Garcia and Baxley took a slight detour to meet Baxley's family, who were all standing behind a rope barrier. At that point, Garcia picked young Emma out of the crowd and invited her onto the course. Emma's boyfriend can be seen smiling in the background as his girlfriend scoots under the barrier. The Spaniard asked Emma if she spoke Spanish and she responded, "Un poquito," which translates to "a little." The starstruck young lady asked the pro if it was OK for her to be on the course, and he affirmed that all was good. As they walked over a footbridge, the golfer said, "Emma, I have a little surprise for you." At this time, her boyfriend approached them and took a ring box handoff from Garcia. "Thank you, sir. I really appreciate the help," Fonseca said. Then he turned his attention to his future bride. With cameras rolling and the giant video board documenting the moment in real time, Fonseca dropped to one knee and said, "Emma, I love you and I can't wait to spend the rest of my life with you. Emma, will you marry me." Onlookers burst out in a rousing cheer and the video board proclaimed, "She said yes." Garcia fist-bumped Emma's dad. A job well done. To make the occasion even more special, Garcia later presented the couple with a check from The Players Championship for $20,000. They will use the money toward their wedding expenses. Thankfully, Emma said yes. It's rumored that Fonseca would have plunged head first into the pond had she said no. Credits: Screen captures via YouTube.com/PGA Tour. They treated me like family through the whole purchasing process! You can tell that their work is high quality and that they take pride in everything that they produce.